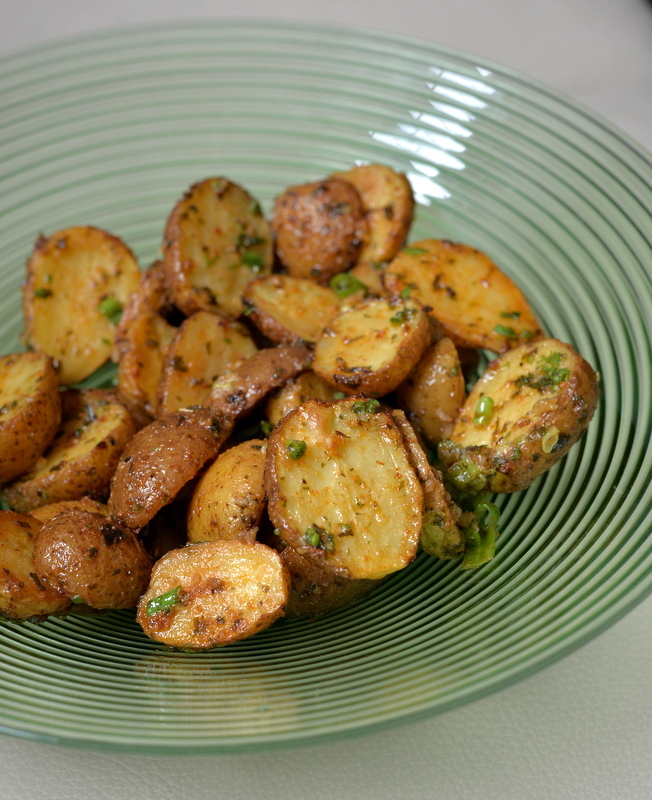 Author’s note: This sophisticated potato salad takes roasted potatoes and dresses them in a light, tangy, mayo-free dressing teaming with fresh herbs. 1. To make the potatoes: Preheat the oven to 375°F (190°C, or gas mark 5.) Line a rimmed baking sheet with parchment or a reusable silicone baking mat. Add oil to a small measure and dissolve the bouillon cube in the oil. Add the rest of the ingredients, except potatoes, and stir to combine. Set aside. 2. Cut the fingerlings in half and add to a mixing bowl. Add the oil mixture and toss to coat. 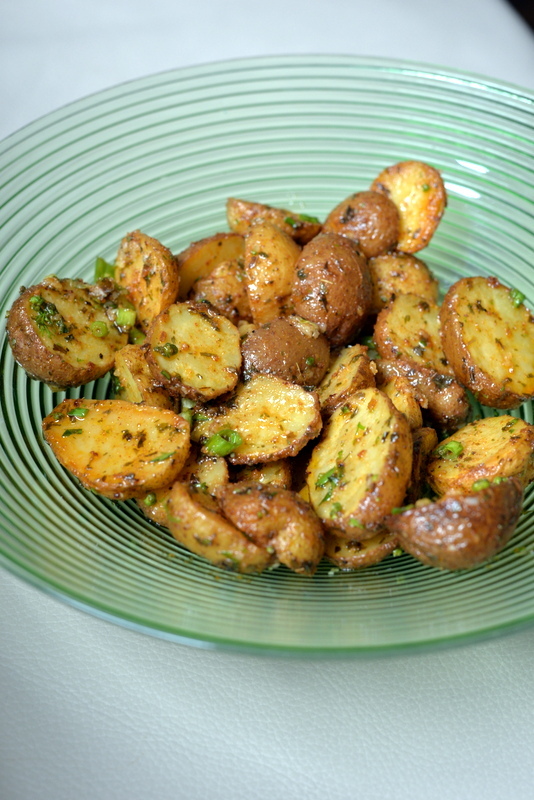 Arrange the potatoes in a single layer on the pan and roast for 35 minute, or until fork tender. Remove from oven and allow to cool completely. 3. To make the dressing: Whisk all the dressing ingredients together in a mixing bowl. 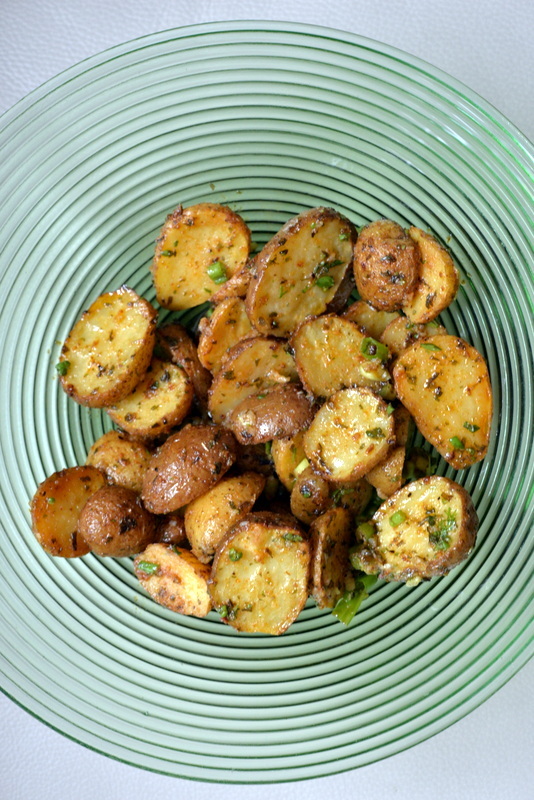 Add cooled potatoes to the dressing and toss to coat. I find it hard to make a vegan replacement for seafood. The cheese flavor (I know Vegan cheese is getting better) but I keep trying that perfect one! These potatoes look awesome. I can’t wait to make them. I haven’t found much to be too hard to be made vegan, but maybe it’s been too long since I had anything meaty that I’m easily satisfied with substitutions! As for restaurants, I wish Japanese restaurants had fewer fish ingredients in everything from miso soup to plain rice so that they’d be easier for vegans to eat at. Vegan mac & cheese is hard to get right. I have not found a vegan butter substitute that I like, but I look forward to trying the one in this book and Miyoko’s recipe. Hi Janet. Thanks for posting this. Sounds excellent. And I’m tired of buying into the popular notion that potatoes are at best a junk food and at worst some fattening thing with no nutritional value. I’m rebelling—and eating potatoes again (and enjoying every mouthful!). Aged cheddar cheese – I’d go overboard on occasion. And ribeye steak grilled medium RaRe. Thank goodness I live alone. If either of these appeared on my plate I’d be a goner. I don’t even look for a substitute, I just stay away from where it might be offered and ENJOY my vegan diet! The most difficult for me are vegan cheese and vegan yogurt. I’ve tried several recipes but none of them hit the spot. I’m looking forward to trying the recipes in this book. 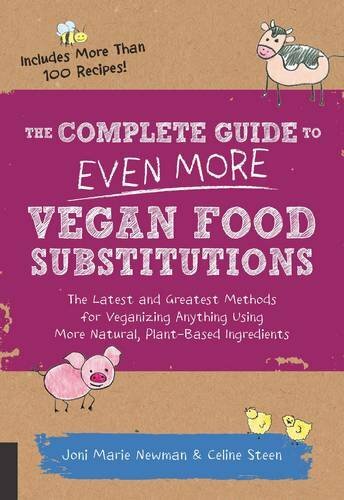 I do have the first Guide to Vegan Subs, and quite a few of its recipes have been in regular rotation ever since it came out. I’m looking forward to finding new favorites in that one too. The potato salad you shared sounds like it’ll find a place among our new faves, for sure! That salad looks so good – I love roast potatoes and am sure i would have struggled not to just eat them from the pan too. The book sounds great – I confess I bought the first substitutions book and haven’t really spent much time with it because I bought it on holiday and when I got home it disappeared in the pile of goodies I had bought. Miyoko’s recipe for butter was as good as advertised–I did eat it with a spoon. Had to put it far back in the fridge… Other than that, sharp cheese. Hi Diane, Congratulations! You won the cookbook. Please check your email. The cheese recipes in the book look interesting — cheese is the hardest thing for me to replace. My family is willing to eat my plant based creations, but they really want cheese on their pizza, parm on their pasta, etc. etc. The potatoes look delish! 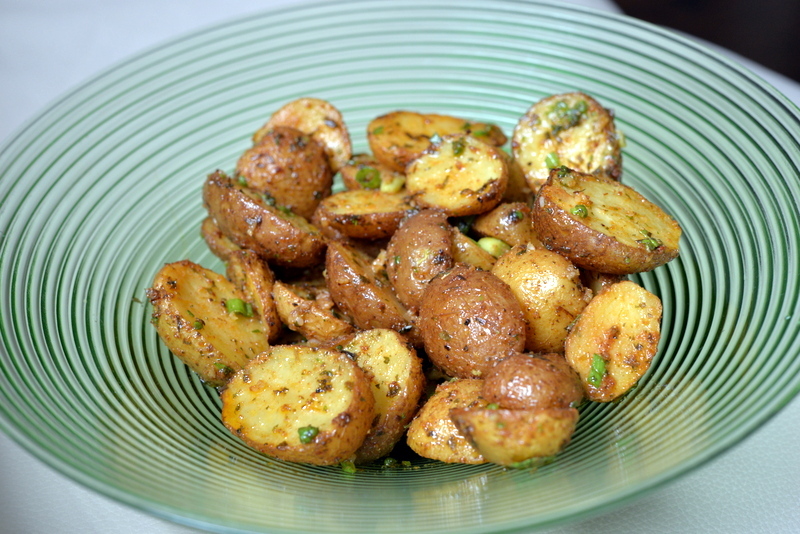 Great variation on potato salad. Vegan is good all by itself, don’t need substitutions. Seems like anything can be made vegan nowadays! But I’d say the hardest for me is kosher for Passover desserts because those rely so much on eggs! Seafood! Especially tuna in casseroles. I have not found a substitute for cottage cheese. I have been having trouble making a good homemade vegan cornbread. It’s one of my favorite things in the world (not sure why), but every recipe I have tried has been dry and dense. Luckily one of the vendors at my local farmer’s market makes a vegan version that is to die for. I get myself a big chunk (or two!) almost every weekend. That is one awesome salad Janet. I’ve pretty much given up dairy and my husband is more than happy with my vegan versions of classics. Thank you as always for sharing with NCR.